The 2002 Winter Olympics were hosted by Salt Lake City, Utah. 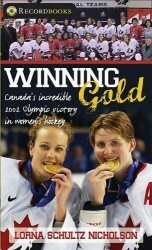 Just four years previous, Women’s Hockey had become an official Olympics sport, at Nagano, Japan. There, the Canadian team had been favoured to win the gold. In a disappointing gold medal game, Canada lost to the USA. Now, heading into the 2002 Winter Games, they’re on a losing streak. What would it take for the Canadian women to bring home the gold?